Making your home ready for guests isn’t always easy, but it’s something that we all know we need to do whenever we have company coming to visit. One of the most important rooms when it comes to preparing for family or friends is the bathroom; despite the fact that no one will be spending much time there, it still needs to be spotless and well stocked in order not to leave a bad impression. If you really want to give your guests the 5-star hotel experience during their stay at your home, we’ve got a few suggestions on how to do it. First things first—it’s time to make your bathroom absolutely spotless. The sink, toilet, bathtub, and shower stall should be scrubbed and disinfected, and the floor should be swept and mopped. You might also want to give the walls a good scrub, too, in order to give them the spotless look that freshly cleaned rooms have. There are a lot of items that need to be in a bathroom—soap, toilet paper, hand towels, tissues, shampoos, and more. If your guests are spending the night, then it’s time to stock up on enough of these items to keep everyone satisfied. Even the most attentive packers will occasionally forget something, and they’ll be incredibly grateful if you have extra toiletries on hand when that happens. When you have guests in your home, you want them to feel welcome and like they’re staying somewhere pleasant. One of the easiest ways to touch up your home a bit for them is to add some decorative touches. It doesn’t have to be much—a bouquet of flowers and some scented soap or some air freshener will be enough to make your bathroom feel much more welcoming and comfortable. Company coming to visit is the perfect opportunity to get rid of your old, outdated bathroom supplies and replace them with something fresh and new. If your towels are starting to look a little worn or your shower curtain has seen better days, throw them out and replace them. Your guests will appreciate the effort, and, as an added bonus, you’ll have a bathroom stocked with brand new accessories. 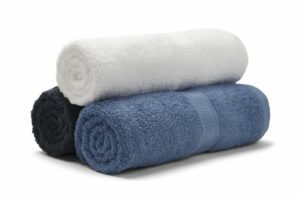 Even if your towels haven’t been used recently, there’s something special about freshly washed and dried linens. 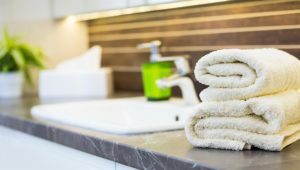 Take the time to wash and dry all your towels so that they feel and smell as fresh as possible and make for the most pleasant bathing experience possible. If one of your guests has a headache, are you prepared? Or what if someone cuts their finger or strains a muscle? Make sure your medicine cabinet is well-stocked with Tylenol, Band-Aids, and any other medical supplies that are needed to treat common household injuries. Want more suggestions on how to spruce up your bathroom? The bathroom enclosure experts at American Bath Enterprises, Inc. are here to help. Give us a call today at 888-228-4925.